Ah, swing, well, we used to call it syncopation—then they called it Ragtime, then blues—then jazz. Now, it’s swing. Ha! Ha! White folks yo’all sho is a mess. Dixieland I think was introduced in ’14 or ’15, and then the Swing Era came in 1928 and lasted ’till 1935, ’36. That one sentence uttered by Parker, together with lots of documented evidence (including hundreds, if not thousands, of audio and filmed recordings) that swing music not only existed but flourished for several years before 1935, was enough to prompt me to change to referring to the earlier era, extending from the late Jazz Age to approximately the beginning of the received Swing Era (sometimes specified precisely as Benny Goodman’s engagement at the Palomar Ballroom starting on 21 August 1935) as the first Swing Era. Swing music abandoned the string orchestra and used simpler, “edgier” arrangements that emphasized horns and wind instruments and improvised melodies. The overall effect is a more sophisticated sound than the styles of the 1920s, but with an exciting feel of its own. Most jazz bands adopted this style by the early 1930s, but “sweet” bands remained the most popular for white dancers until Benny Goodman’s appearance at the Palomar Ballroom in August 1935. The audience of young white dancers favored Goodman’s “hot” rhythms and daring swing arrangements. “Hot Swing” and Boogie Woogie remained the dominant form of American popular music for the next ten years. Feature Pages (Internal) – For the composers and bands the term Pre-Swing will be applied (for now) to early compositions and performances ranging from about 1927-35, with variation on the earliest year. 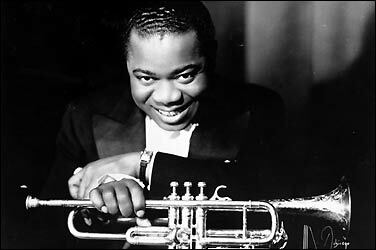 Louis Armstrong and his Hot Five: recordings of 1925-1928 — Note, 4 April 2016: I plan to eventually change the links to .ra files presently used on this page to embedded audio players. I think archive.org has audio files of most, if not all, of the recordings included here. The second, or predominantly white band leader, Swing Era was the period of time (1935–1946) when big band swing music was the most popular music in the United States. Though the music had been around since the late 1920s and early 1930s, being played by black bands led by such artists as Duke Ellington, Jimmie Lunceford, Benny Moten, Cab Calloway, Louis Armstrong and Fletcher Henderson, most historians believe that the Swing Era started with Benny Goodman’s performance at the Palomar Ballroom on 21 August 1935, which sparked a movement which quickly spread across the country. Other band leaders who rose to prominence during this time include brothers Tommy and Jimmy Dorsey, Glenn Miller, Count Basie and Goodman’s future rival Artie Shaw. Several factors led to the demise of the Swing Era: the recording ban from August 1942 to November 1944 (The union that most jazz musicians belong to told its members not to record until the record companies agreed to pay them each time their music was played on the radio), the earlier ban of ASCAP songs from radio stations, World War II which made it harder for bands to travel around as well as the “cabaret tax”, which was as high as 20%, the change in music taste and the rise of bebop. Though Ellington and Basie were able to keep their bands together (the latter did briefly downsize his band; from 1950-1952), by the end of 1946, most of their competitors were forced to disband, bringing the Swing Era to a close. * 18 June 2017 update: Neither of the two quotes presented here still exists in the Wikipedia page on Swing music.